Christmas is often referred to as the mystery of the Incarnation, so it seems appropriate to keep up the mystery theme. 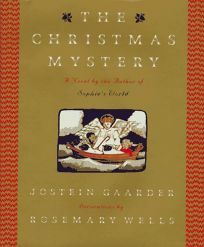 A wonderful Advent book is The Christmas Mystery by Jostein Gaarder. The Norwegian author is most famous for his 1994 book, Sophie’s World, a fantasy adventure that teaches the history of Western philosophy. In The Christmas Mystery a child named Joachim disovers a magical Advent Calendar in his attic and meets Elisabet who is the guide for each day of Advent. Gaarder does a wonderful job of weaving contemporary thinking and history with the whole Advent/Christmas narrative. I especially enjoy the way Joachim’s parents slowly become hooked into the whole thing.